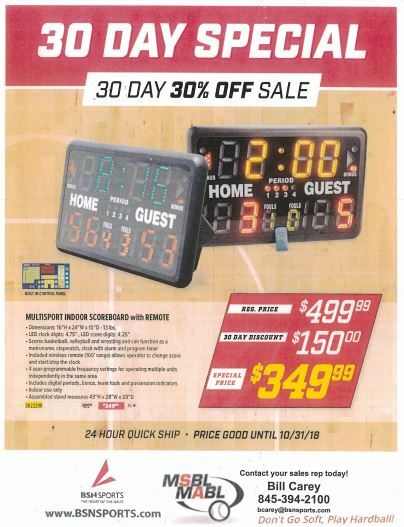 Attached is a special we are running on scoreboards for any MSBL players who are involved in winter sports as coaches, recreation directors, etc. If anyone is involved in a school, parks and rec, church group, Boys and Girls Club, YMCA or any organization that might need a table top scoreboard at an incredible price, please call me. This is a great deal and a wonderful opportunity for any MSBL members who may be involved in other sports and organizations.